Currently I’m working on a project which uses Microsoft Project Server 2007. However the SDK is poorly documented. Today I was looking at the Admin web service which can be used to configure settings on the server. In this post I’m not going in to detail how to do this, but I’ll share with you what I’ve discovered. 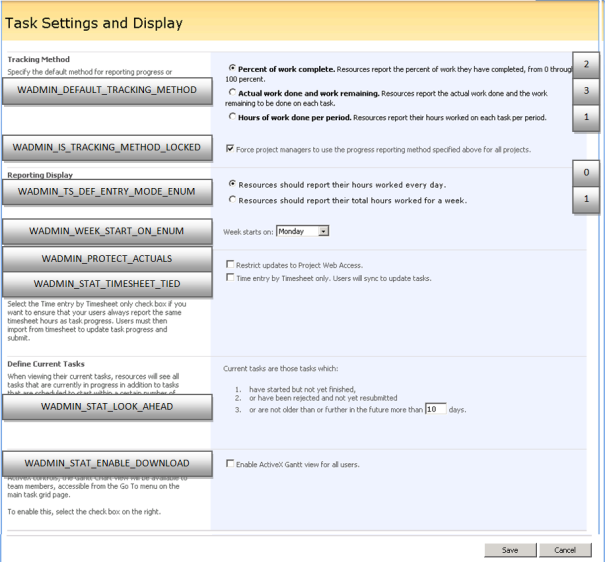 WADMIN_DEFAULT_TRACKING_METHOD Specify the default method for reporting progress or tasks, and whether the tracking mode should be enforced on all projects. 1 = Hours of work done per period. 2 = Percent of work complete. 3 = Actual work done and work remaining. WADMIN_IS_TRACKING_METHOD_LOCKED Force project managers to use the progress reporting method specified above for all projects. WADMIN_PROTECT_ACTUALS Restrict updates to Project Web Access. WADMIN_STAT_ENABLE_DOWNLOAD Enable ActiveX Gantt view for all users. WADMIN_STAT_LOOK_AHEAD Current tasks are those tasks which are not older than or further in the future more than this amount of days. WADMIN_STAT_TIMESHEET_TIED Time entry by Timesheet only. Users will sync to update tasks. WADMIN_TS_DEF_ENTRY_MODE_ENUM Specify how you want resources to report their hours. 0 = Resources should report their hours worked every day. 1 = Resources should report their total hours worked for a week.